In all of the passing play designs, the route depths, pass protection and QB drops(3,5/7 steps) are tied together. It doesn’t take much to throw off the timing. If someone is not on the same page, disaster looms. But, sometimes when they break down, players make plays. 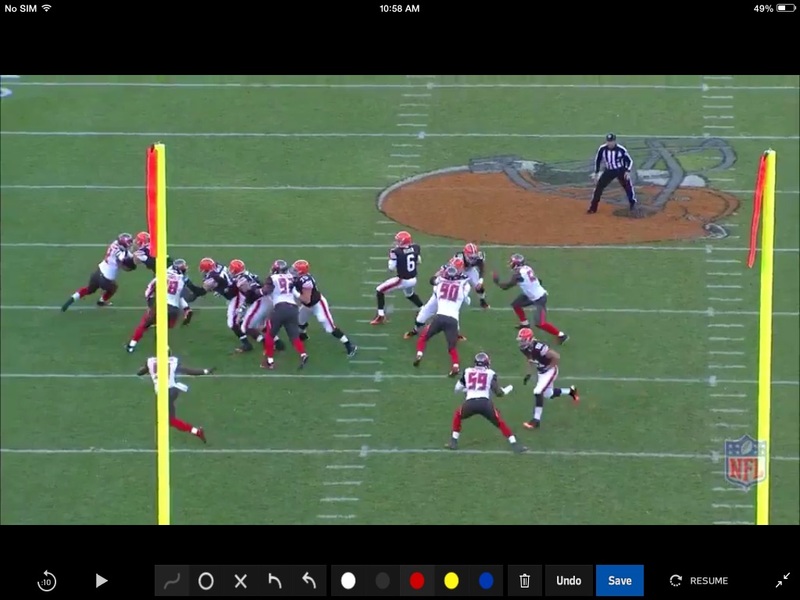 That’s what Hoyer and Gabriel did for a TD vs Tampa. Excellent job by Hoyer and Gabriel on this play. It initially started out as a three step hitch to TG. 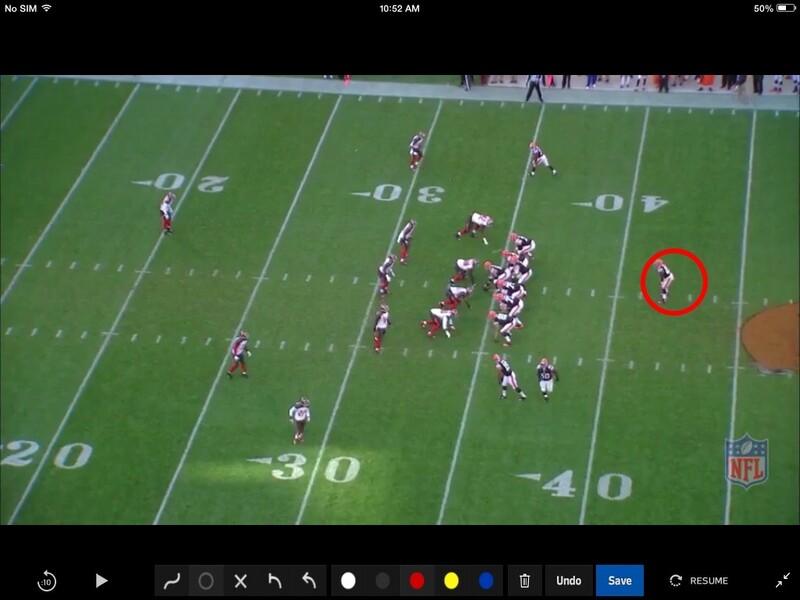 As you can see in the picture below, he ran about a six yard route and Hoyer is about 5yds deep. 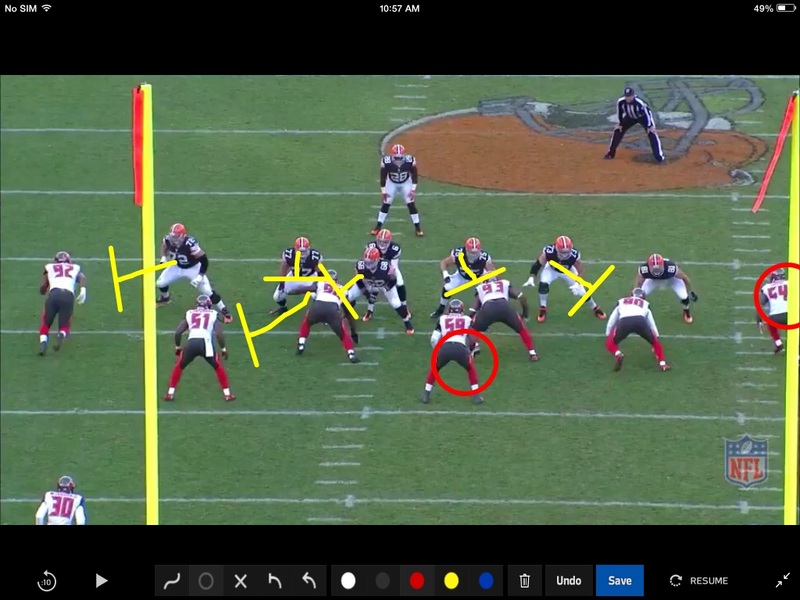 Hoyer may have felt the line backer so he didn’t throw the hitch. 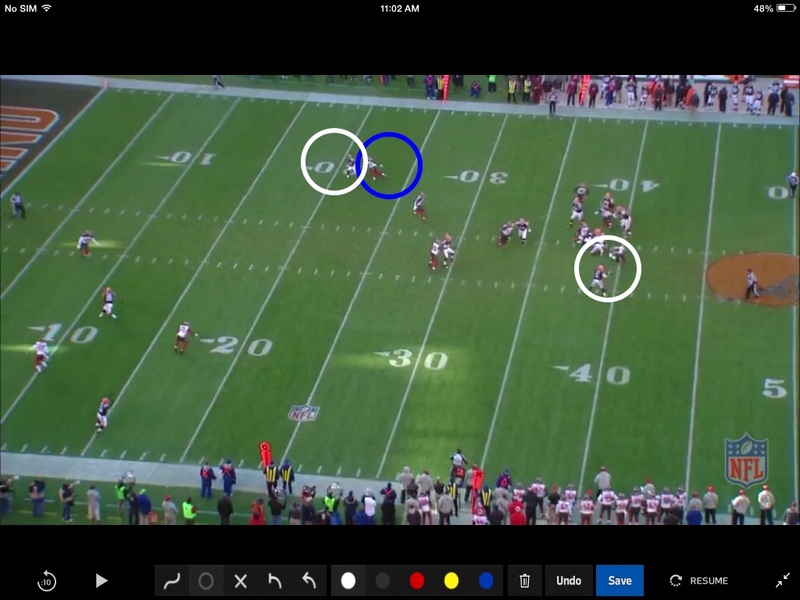 Both he and the receiver adjusted and the protection held up long enough to make the play. Let’s take a look at the pass protection. The pass protection starts out being a three step protection. The fullback motions out of the backfield and leaves West (34) almost 7 1/2 yds deep. That’s toooo Deep! for a three step pass. West should be no deeper than 6yds… 7yds max… He should take his alignment first or make the FB move up so he can get to an appropriate depth. He can use the fullback as camaflogue, so the defense can’t pick up his alignment. I break down the pass protection responsibilities below. The lineman have the 4 down lineman and the weak backer (Will #51) and the back has the middle (Mike #59) and the strong side backer (Sam#54) One to two. 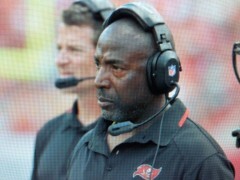 The Sam backer is the most dangerous in this situation because he’s on the line of scrimmage (L.O.S.) and is an immediate threat. The runner needs to go get him right away, so he doesn’t meet him right at the QBs heels. #34 didn’t seem like he expected the Sam to come. He should be cocked and ready to explode to the blitzer. Any delay by the runner will give the rushing defender an advantage. 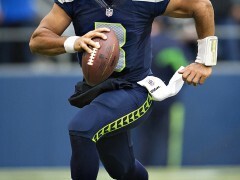 You can see below, David is almost to the QB. West has a right to cut on a three step and in case of emergency, but this is real iffy here. West false stepped coming out of his stance and gave #54 a head start. Cutting this close to the QB is dangerous to the QB and the play. West should be cutting the defender now as opposed to where he ends up. On this occasion he gets away with it. I heard the commentator say great job and good block, but in actuality, he was lucky this wasn’t disasterous. Players making plays is a great thing. Love to see it when it comes together. I hope this gives you more insight into the “game within the game.” Hoyer felt the pressure, rolled to his left and found the open receiver. Win!